#JodyRookstool I have never been to Texas, but would love to go sometime. I know that it's rich in history, legends and natural beauty. 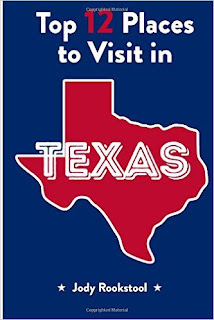 Jody Rookstool's Top 12 Places To Visit In Texas gives some insight on some awesome places to go and see. Being from Texas, Jody Rookstool gives some ideas that are off the beaten path, not just tourist trap amusement parks. In this booklet the sites are described, but also a little of the history of each place is given. It's a short booklet but I found it to be informative and interesting. There's a few places listed that I would like to see myself if I ever make it to Texas. I found this booklet to be both informative and entertaining. I received this product for free and was compensated for my honest unbiased review.